John W. McCormack, Carl Albert, Hale Boggs. "Letter from John W. McCormack, Carl Albert, and Hale Boggs to Democratic House Colleagues Regarding H.R. 6927." 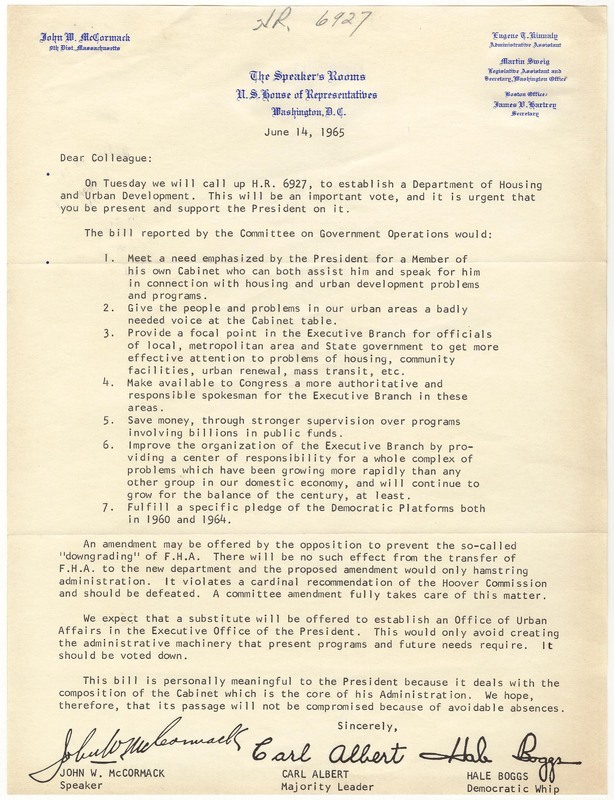 Letter from John W. McCormack, Carl Albert, and Hale Boggs to Democratic House Colleagues Regarding H.R. 6927, June 14, 1965; “H.R. 6927 3 of 3” folder, Legislative Files, Box 9; Committee on Government Operations; 89th Congress; Records of the U.S. House of Representatives, RG 233; National Archives.. Accessed 20 April 2019. http://acsc.lib.udel.edu/items/show/275. Letter from John W. McCormack, Carl Albert, and Hale Boggs to Democratic House Colleagues Regarding H.R. 6927, June 14, 1965; “H.R. 6927 3 of 3” folder, Legislative Files, Box 9; Committee on Government Operations; 89th Congress; Records of the U.S. House of Representatives, RG 233; National Archives.